Students should continue to be inspired by the leadership, strength, truth, beauty and courageous spirit that Mam’ Winnie Mandela epitomised in order to amplify her legacy. 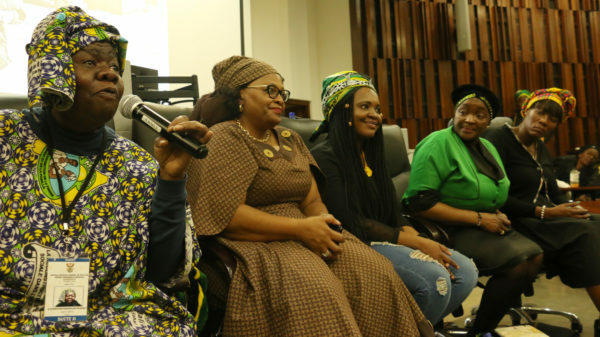 This was the message echoed by the panelists who spoke at Wits University on April 11, following a screening of Pascale Lamche’s documentary Winnie by the African National Congress (ANC) Women’s League Young Women’s Desk – Wits in honour of the late Winnie Madikizela-Mandela. The panel discussion, chaired by former Wits SRC member Lwazilwaphesheya Khoza, included Minister of Women in the Presidency Bathabile Dlamini, Minister of Communications Nomvula Mokonyane, Harlem-based scholar and human rights activist Queen Mother Dr Delois Blakely, ANC Youth League Deputy Secretary General Thandi Maraka and and third-year LLB student Tholithembelihle Ngwenya. Dlamini described Mam’ Winnie, who died on April 2, as a lioness who dared to tread where others did not. “What I saw in her was honest love. Deep love. Real love. uMam’ Winnie when you do something wrong she will deal with you now and move on. She fought ipatriarchy [patriarchy] with all the might she could; inside and outside the ANC,” she said. Mokonyane told the audience that introspection be a starting point for fighting injustice while she reflected on the black consciousness ideology which shaped Madikizela-Mandela. “It starts with consciousness. You must understand identity. You cannot fight for non-racialism when you don’t understand who you are, what you are and what makes you to be who you are. That’s where it starts properly. It was that black consciousness that molded uNomzamo [Mam’ Winnie],” she said. Ngwenya added that university students should take knowledge from their institutions back to their communities. “Being in the space that we are in, we need to understand our privilege. We need to understand different types of feminism in different ways. We need to learn to simplify and breakdown these concepts and be able to relate them back to our communities. We need to understand that our struggles are not new,” she said. Left to right: Queen Mother Dr Delois Blakely, Nomvula Mokonyane, Bathabile Dlamini, Tholithembelihle Ngwenya and Thandi Morake. Photo: Onke Ngcuka. Madonsela added that her organisation plans on keeping the spirit of Mam’ Winnie alive by continuing to tell her story. “In every space we exist, we will disrupt societal norms that are anti-black. We will disrupt those spaces, occupy spaces to resist where women are said to not exist,” she said. Honours in Development Studies student Zipho Jukuju, who attended the event, told Wits Vuvuzela that a lot of the truths displayed in the Winnie documentary were truths that had not been told about Mam’ Winnie. “She didn’t care about what people thought of her, she knew what she wanted. Regardless of being in the spotlight, you must remember why you started the fight [for justice]; to be selfless and do it for the people,” she said. The panel reiterated that the young women should never underestimate their power and ability to impact society, and that education is a powerful tool that should be used to solve the challenges of society. Lamche’s documentary reflects on Mam’ Winnie’s role in the apartheid struggle, highlighting her contribution to South African democracy. Wits Vuvuzela, Winnie Madikizela-Mandela: revolutionary who kept the spirit of resistance alive, April 6, 2018.